But as time continued onward we started to get into the groove of things. After a lot of research I had found a milk delivery service that actually came to my town. We made do that first month without our co-op order and the steer finally came in. We visited the farmers’ market every Saturday and if something came up and we couldn’t make our local one, we were able to always find another one in a nearby town that we could go to. Our little urban farm started to become more productive and eventually we were able to provide all of our own dairy from our two goats. We met a lot of great small family farmers and built relationships with them. They answered our questions, gave us tours, and we relied on them for our food. We learned that you don’t have to produce your own food to give up the grocery store, you just have to get out there and meet the people that do produce your food. Not to mention that we saved money on food while buying higher quality products. About 6 months into our year we realized that it was pretty easy and that we wanted to have more of a challenge. We decided to go the last three months of our challenge without buying any food. We would have to rely on what our little lot could provide us along with anything we had on the shelf. We were so far behind on planting due to Mother Nature refusing to cooperate that I was worried we wouldn’t have anything to eat fresh. 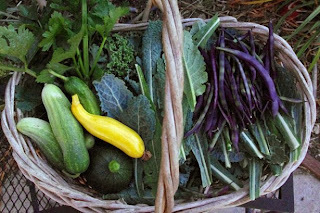 We got lucky and our first big harvest was the day we started the three month challenge. For those first few weeks we were limited to cucumbers, green beans and zucchini. That was probably the hardest part of the challenge – having such a limited diet. And because of our less than stellar weather during the first part of the year, our fruit trees were a complete failure. On the plus side though we learned first hand what we should have in storage in case of emergencies. We also developed a bartering system with friends which helped strengthen our community. After a year of being free from grocery stores we decided to continue this journey indefinitely but we’ll allow ourselves one restaurant visit a month. We met a lot of great people along the way and we learned a lot about ourselves. That was a great test of your household pantry / garden! Isn't it amazing how much we think we need those big stores, but it's just all been ingrained into our heads because, well, "everyone else does it that way" or "that's how we've always done it". In the process of modernazation, we've neglected our neighbors….they probably had too many green beans and we had too much milk, but we never got to barter for them because we didn't even take the time to talk to them besides saying hello or waving on passing. Congrats on your year without groceries. Definitely an inspiration to show that we don't have to rely on supermarkets and grocery stories. Wonderful! Not sure I could do it but I find you very inspiring. Your experiment is making me think through more things….thanks for the inspiration! Really awesome! I can't wait till we don't have to go to the store. Amazing story! I have a few questions for you though. How big is your family? How about your home, is it in the country or are you somehow raising goats in the city? How much space do you have for your garden? I’m interested in starting a garden but we’re almost at 6 kids and I’m thinking we need a farm! Hi Ryan! Right now our household consists of 3 adults and 1 teenage boy (the term “hollow leg” applies here). We live in the city on a quarter acre lot. Our garden occupies approximately 900 sf of that lot.